“It was fantastic!” “I learnt so much.” “Now I know lots of ways to be green!” These were some of the things the pupils from Greenway Primary School said about their first Eco Day held on Thursday 25th April 2013. What a lovely sight it was to see all the pupils from Nursery to Year 6 getting involved in a wide range of Eco centred activities. 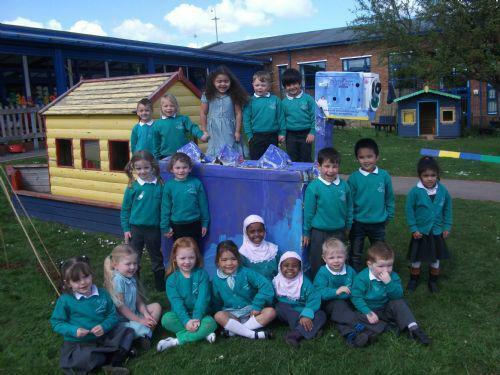 Nursery and Reception classes joined together to make models from junk materials (one model they made was a giant blue dinosaur named ‘Ecosaurus’); play a water chute game (where the water was reused and not wasted! ); learn how to make a healthy fruit salad (and eat it!) and made bird feeders to attract more birds into the garden. Year 1 focused on Global Citizenship by researching the different heritages in the class (there were links with 28 countries altogether). They researched the flags and created a giant flag displaying each country. They also cooked food from India and China which was delicious. The boys and girls in Year 2 explored Fairtrade. They made a cake using only Fairtrade ingredients. The Fairtrade logo was depicted in a range of different mediums to make individual collages. Year 3 learned about reducing pollution and saving money by growing their own food. They would like to say a big thank you to Blooms Garden Centre for donating the compost and strawberry plants. Year 4 upcycled a range of glass jars they had collected into beautifully decorated tea light holders. The local area had a team of children from Years 5 and 6, along with Tom & Alice from the environmental department of Cardiff County Council, who were on a mission to collect all the litter from Llanstephan Road and Cae Glas Road. Shockingly, they collected 15 sacks of rubbish. The children also designed posters and flyers which will be displayed and distributed in the community to prevent littering in the future. Alice and Tom said that children from Greenway Primary were the most enthusiastic of all the groups of children they had worked with this year. At the end of the day the whole school celebrated our successes with an assembly. All the staff and children played their part and Greenway Eco Committee were very proud of everyone’s hard work. It was a wonderful, fun packed day.